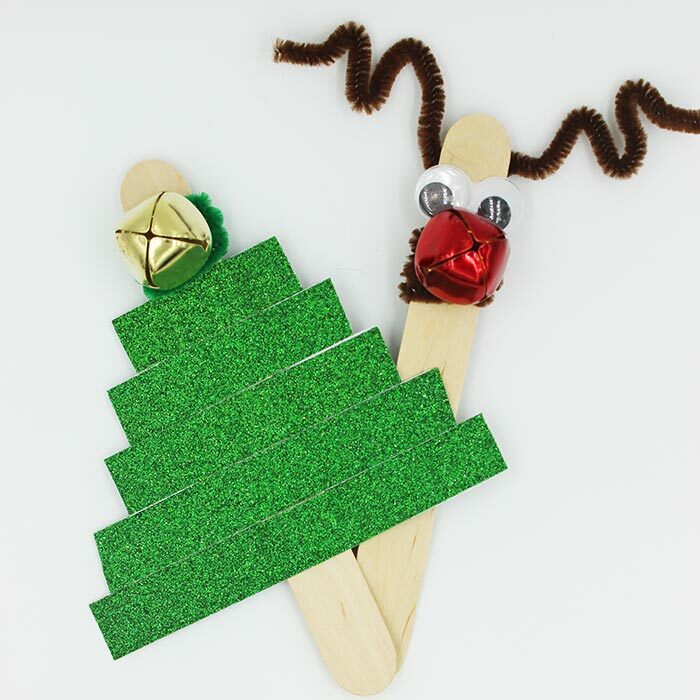 Kids love these jingle bell sticks that look like Rudolph & a Christmas tree! "Jingle Bells, jingle bells, jingle all the way..."
Is there anything that makes you think of Christmas more than Jingle Bells? It's the first Christmas song that my boys learned to sing and they haven't stopped singing it since Thanksgiving. 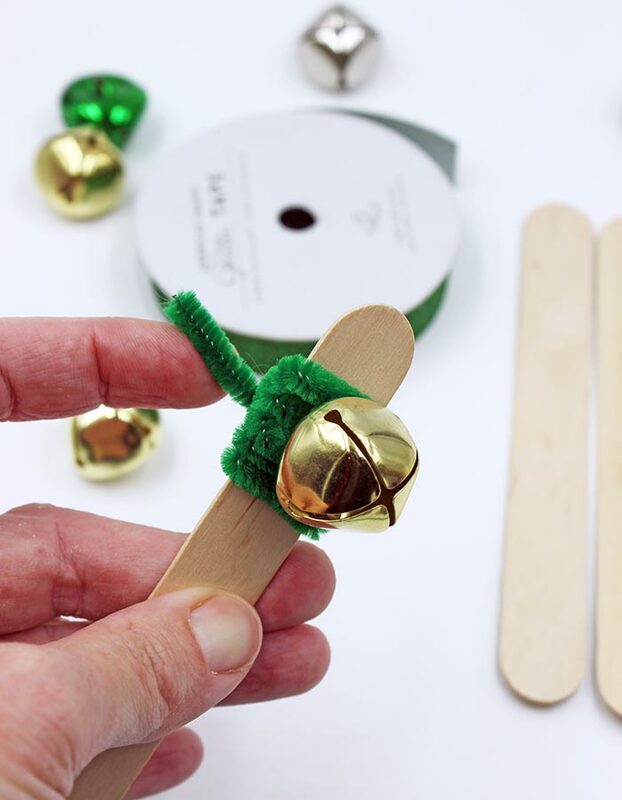 We love having Christmas music sing alongs in our house and last year, we made some super fun Rudolph jingle bell sticks to accompany our songs. I thought we'd make another one this year and came up with a glittery Christmas tree! 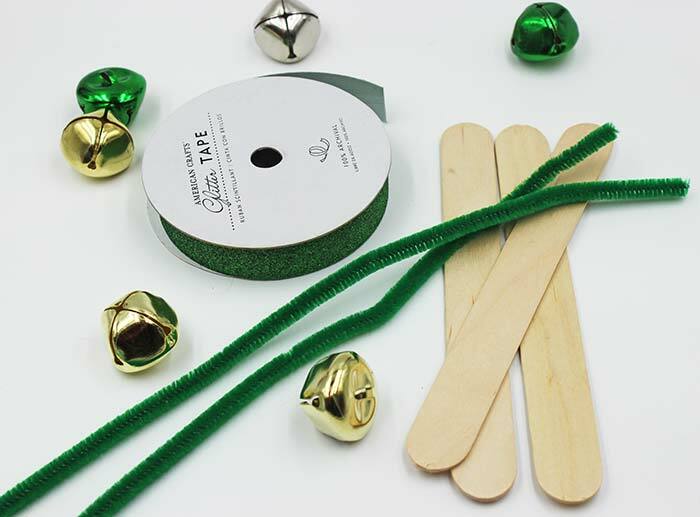 These are both easy Christmas bell crafts for kids to make, and they love playing with them too. Here's how you do it. We made the Rudolph jingle bell sticks (pictured above, right) last Christmas for our friends at Pre-K Pages. You can find the complete tutorial here. 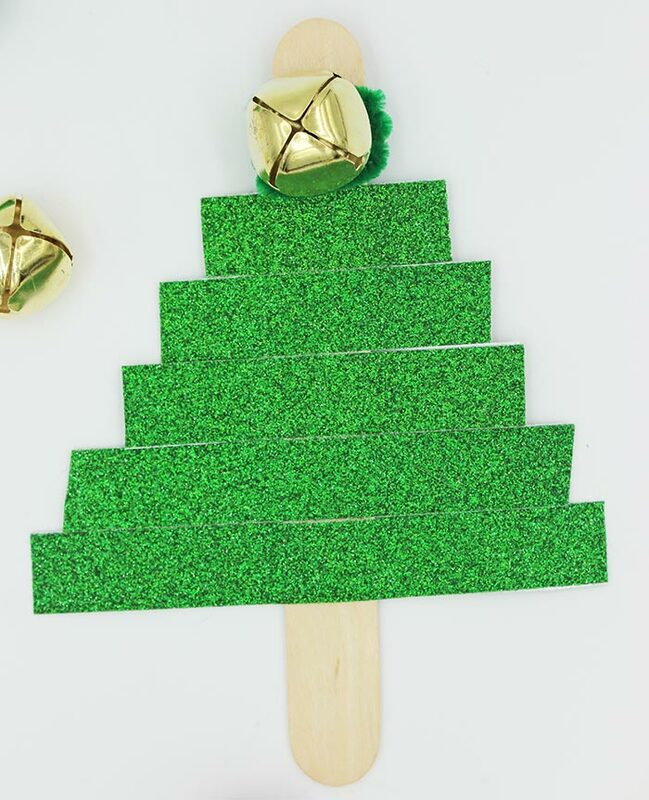 We decided to make a Christmas tree version this year - it's just as easy and so cute! 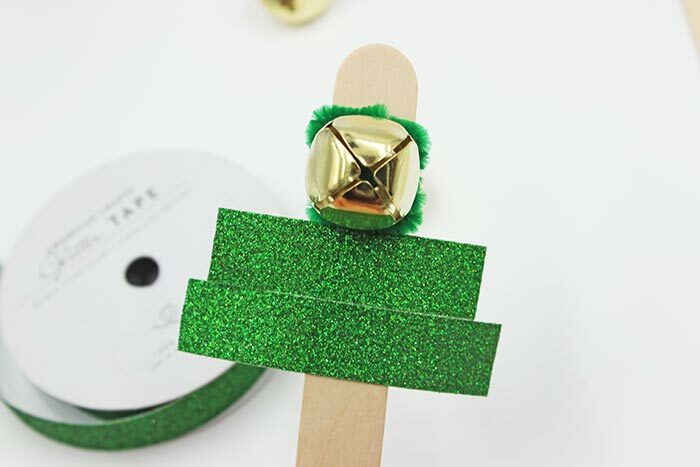 Start by wrapping a gold jingle bell around the top of a craft stick. Do this by threading a chenille straw through the loop on the back of the bell, then wrapping it tightly around the stick. 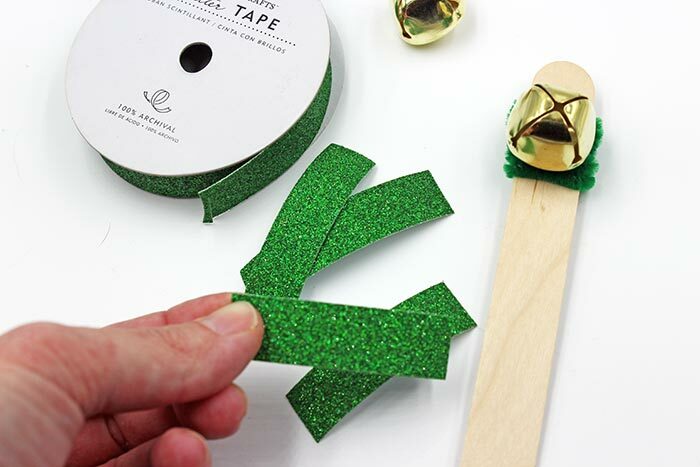 Then cut your tape pieces that will become the body of the tree. You'll need 5 pairs of tape (10 pieces total). Each pair should be approximately 1/2 inch wider than the piece before. Mine ranged from 2 inches at the top to 4 1/2 inches at the bottom. Center the smallest piece of tape directly under the bell, then repeat with each subsequent piece down to the largest. Then flip your tree over and repeat on the back with the other set of tape pieces. Trim any excess or overlap, and your tree is complete! That's it! 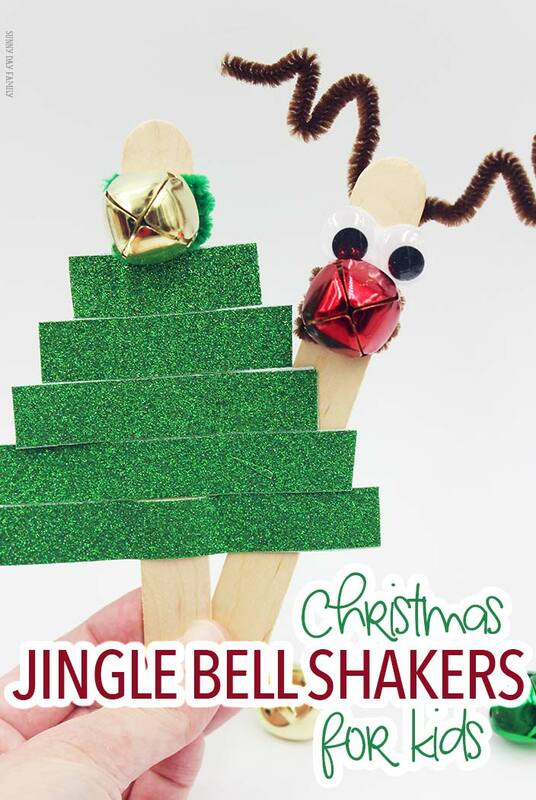 Now you're ready to go Christmas caroling, or just have a fun Christmas sing along at home. So easy and lots of fun! Are you finding all kinds of fun family activities to try this Christmas? Get organized and don't miss a thing with my printable Christmas planner! With over 25 planning pages, you'll get everything from calendars and checklists to gift tags and Santa letters. Check it out here.